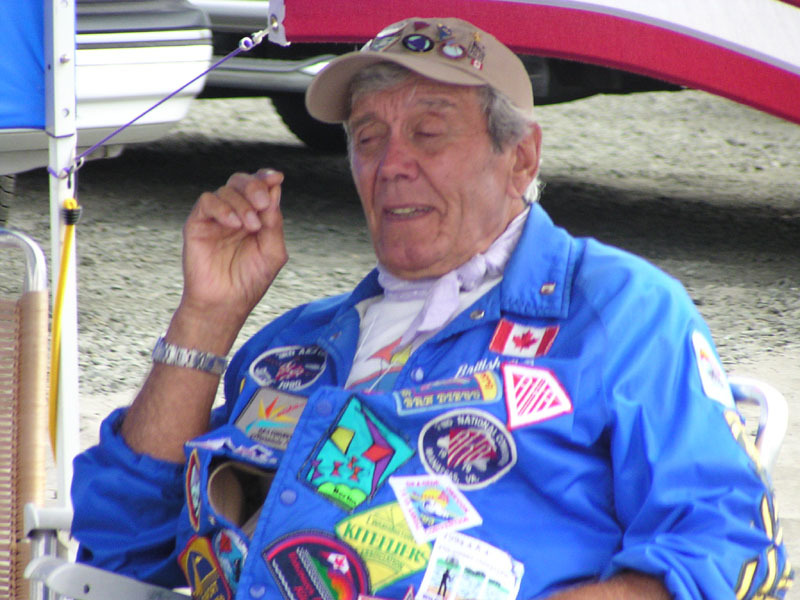 Art Ross was born in 1924, was a founding member of BCKA. He had a passion for kiting for many years, went to many festivals world wide, and was very visible with his large creations. He passed away at age 88, in August 2012 during WSIKF week, a festival he regularly attended. 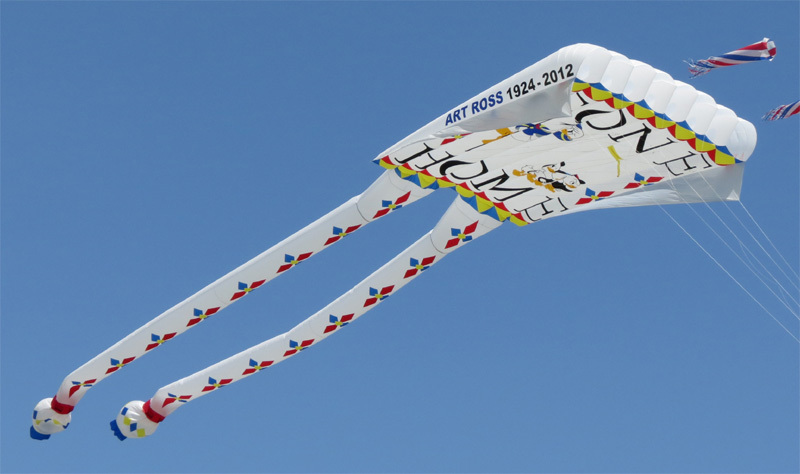 “GONE HOME” is a kite built as a tribute to a master kite builder. 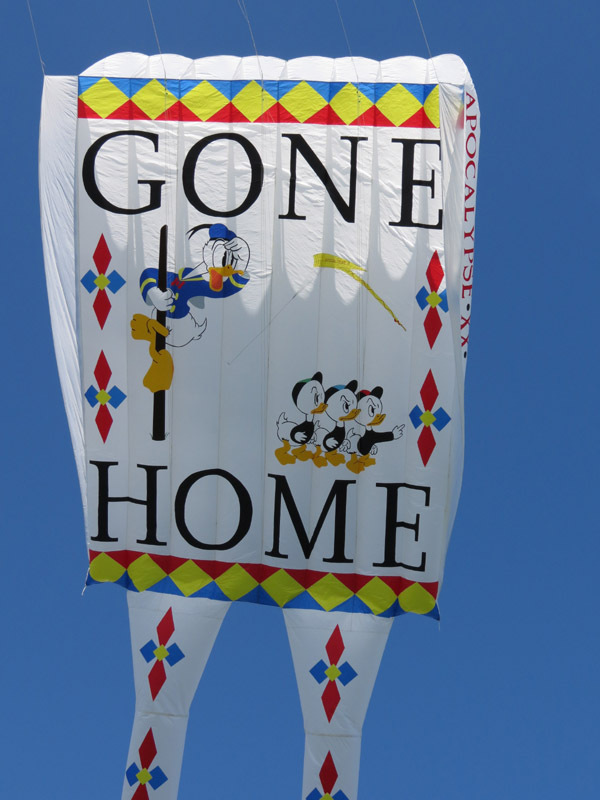 Art has “gone home” to heaven, leaving his kites behind and his friends looking for him. This kite is at least 75% Art’s design. He made a drawing of Donald and his nephews, as seen on this kite, but never used. The dual tails are also his design, down to the diamonds and colors — again a design he never used it. The yellow side-profile of a flowform kite is a side profile of Apocalypse II, Hawaii 1989. This was still seen flying in France in Dec. 2012. Art called his flowform kites the “Apocalypse” series, because he thought Apocalypse meant “big and beautiful”. When he found out Apocalypse meant “big and catastrophic”, he decided to carry on with the series name anyway. He made a total of 19 of the creations; that is why I have made this one #20. Of the 19 flowforms, only 1 has dual tails. So when I found the dual tail pattern, I decided to use it as a tribute to him. The 19 flowforms range in size from 200 – 1200 sq. feet. The biggest, “Gone With the Wind”, #XI has dual tails that are each over 100 feet long. Most of this series are still flying. He built this series between 1987 and 2009. “GONE HOME” is 500 sq ft. (20 feet wide by 25 feet long). The tails are each 52 feet long. This kite took me about 400 hrs to build, from conception to being ready to fly. I am honored to be called his friend. 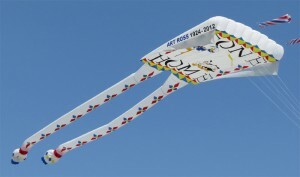 I am honored to build this kite in loving memory of my friend, mentor, and fellow-kite-flyer. Art Ross, may you rest in peace.